Phyllozoon hansei was originally interpreted as a frond-like organism, however evidence of a holdfast is yet to be observed. 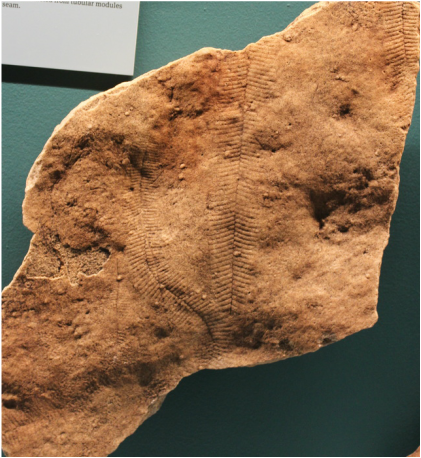 The possibility that Phyllozoon was a Dickinsonia trace fossil has been suggested, although unlikely due to a lack of the typical characters observed, such as: contraction and shrinkage marks, overlap of segment impressions and bilateral symmetry. Gehling, J.G., Droser, M.L., Jensen, S. & Runnegar, B.N., 2005. Ediacara Organisms: Relating Form to Function. In Evolving Form and Function; Fossils and Development. Briggs, D.E.B., ed, Proceedings of a Symposium honouring Adolph Seilacher for his contributions to paleontology in celebration of his 80th birthday, New Haven, Peabody Museum of Natural History, Yale University, 1-25. Frond leaf-like, resembling Pteridinium simplex in its incised zig-zag median line and almost evenly spaced, repetitive lateral grooves, but differing in that the organism was evidently of more or less planar or two dimensional form, not with three ribbed wings extending from the axis; incised axis and lateral grooves evidently representing a resistive skeleton which lay within foliate base of frond; lateral grooves extending from axis a about 70, with their ends curved outwards; spacing of lateral grooves tending to become less at (? )proximal end of frond.